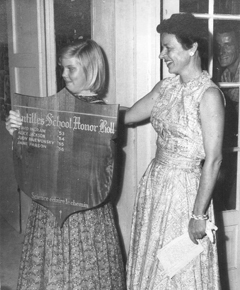 A ntilles School opened its doors on October 4, 1950 in Villa Santana overlooking Charlotte Amalie harbor. The villa was built by the Mexican general Santa Ana as his home in exile. The driving force during the school’s early years was the founding head, Deborah Finch. Ms. Finch’s educational aims were embraced in a five-point program: the child’s physical, academic, and creative development; emotional and social growth. The initial enrollment was 13 students (representing 10 families, a number that grew to 36 students in PreK through 9th Grade the next year. Staff included the Ms. Finch, four full-time teachers, three part-timers and a secretary/bookkeeper. Students came primarily from St. Thomas, with a few boarding students from neighboring islands. By 1955, the school had outgrown its original campus, and Ms. Finch oversaw the move to a four-acre site above the West Indian Company docks in Havensight. Students of that era recall tiny open-air classrooms, assemblies on the terrace with its panoramic harbor view and driving to a field in Long Bay for sports. Eventually a high school was added, with the first class graduating in 1967. The school remained at Havensight until 1971, when it moved to its present 27-acre campus in Frenchman’s Bay. The new site provided purpose-built facilities, playing fields (early students remember spending their P.E. classes clearing rocks from the field) and room for the school to grow. Under the leadership of Mark Marin, headmaster from 1979 to 2001, the student population grew in size and diversity. The school started a financial aid program, which today provides over $1.3 million a year in assistance to 55% of the student body. A successful capital campaign, begun under Mr. Marin’s leadership, has allowed the school to add an athletic complex, a two-story library and a performance and visual arts venue. The athletic complex (the Mark C. Marin Center or the MCM Center) and the performance space (Prior Jollek Hall) have quickly become resources used by the wider St. Thomas community. While much has changed over the years, Ms. Finch’s commitment to educating the “whole child” remains the foundation of the Antilles educational experience. Ms. Finch’s commitment, values, and philosophy are the benchmarks by which Antilles School is measured today.